Alexa and Family (Gary, Hunter and baby Jones) spent the second part of their Island tour with John and I in Edinburgh, Scotland. I wanted to show them the best of Scotland, which was difficult, since they are vegetarian, and the best of Scotland consists of weird and wonderful meat products (haggis, black pudding, lorne sausage patties, steak pie…). As meat products weren’t on the menu we contented ourselves with a little bit of castle, plenty of sightseeing in freezing rain, and boutique yarn shopping! 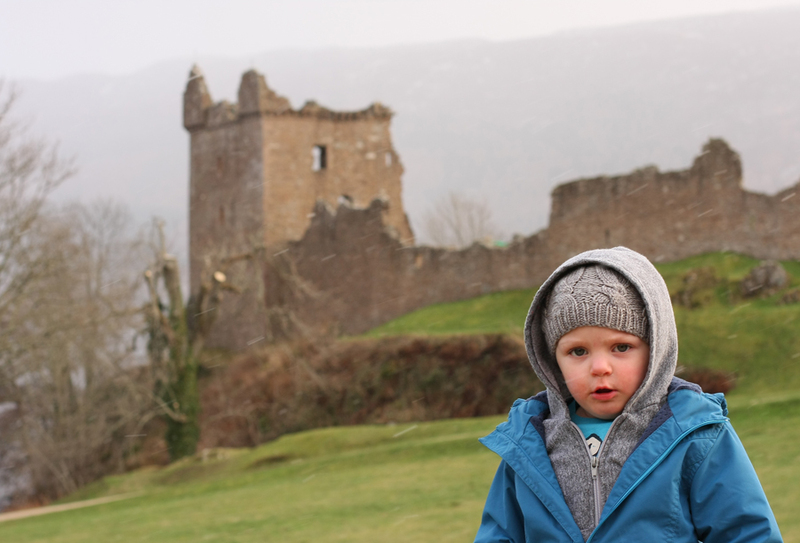 High winds and occasional snow at Urquhart Castle on Loch Ness. Hunter is rockin’ the Bon Bon toque. Vegetarianism notwithstanding, we did an early Burns Day supper of haggis, neeps and tatties. Translation: haggis, mashed turnip and mashed potatoes. What do I know about Scottish-isms? As a Canadian transplant, after all, I have no claim on the place… Except my adorable kilt-wearing, bagpipe-wielding boyfriend! And that’s all it takes. 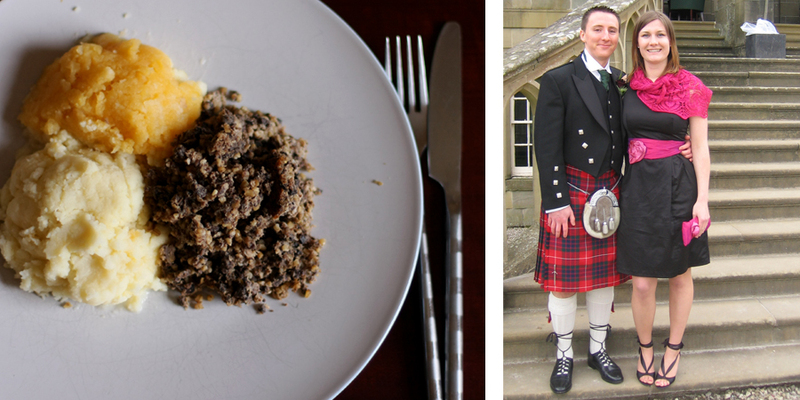 Scottish Delicacies : haggis, neeps and tatties and men in kilts! We toured around a bit: since we are Canadian, it seemed like a good idea to leave Edinburgh at 6am, drive up to Inverness, down Loch Ness to Urquhart Castle, then to see the snowy peaks of Glencoe glowing dimly just after dusk before driving home. John (Scottish) thought this was a crazy plan, but he wasn’t the one squeezed between two car seats in the back of the rental car. Luckily for us it only snowed heavily for the last 1.5 hours of driving! 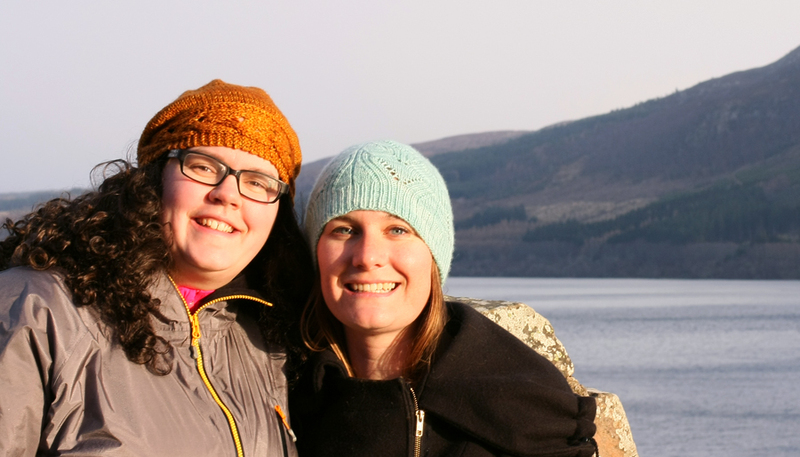 Alexa and I at Loch Ness. 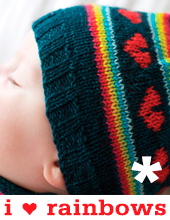 We are both wearing new hat designs – coming soon! It was simply AMAZING to sit across the kitchen table from Alexa while we discussed what Tin Can Knits would make in 2013. Since we began work on 9 Months of Knitting in 2010, we have mostly communicated via skype, phone, and email, so the brief times we have together are precious. Plus, both John and I found it inspiring (sometimes inspiring horror) to have 2 cute babies giggling, yowling, and jumping around in our usually-quiet apartment. Before flying home Alexa enjoyed shopping at K1 Yarns, a lovely boutique in Edinburgh’s Old Town, conveniently located between the Royal Mile and the Grassmarket. The shop carries a beautiful selection of Scottish yarns such as Jamieson’s of Shetland, Harris Tweed Yarns, and Orkney Angora. K1 Yarns is the perfect place to pick a tweedy palette for a fair-isle project like the Bird’s Nest Mittens or the (FREE) i heart cables hat, and the owner Katharine has an excellent eye for color combinations. 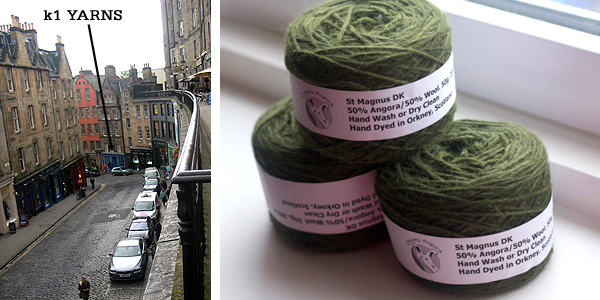 Alexa was well chuffed (English slang for pleased) to pick up some Orkney Angora St Magnus DK which is a 50%/50% wool/angora blend in ‘olive’ – a deep and rich green. 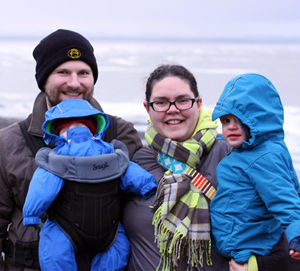 I hope you have enjoyed hearing about Alexa’s tour (despite the gratuitous vacation photos!). We will be featuring a lot more local dyers and yarnies in the next month, as we prepare to launch Handmade in the UK, a collection of lace designs knit in yarns by UK indie dyers and producers. Do you like what Tin Can Knits makes? 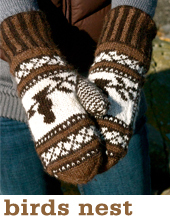 Get our email updates to hear about our patterns and tutorials as they are launched! 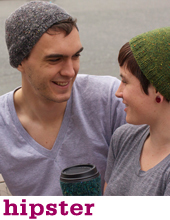 Love the tease of the new hat designs at Loch Ness … when will you spill the beans?! Well… We have a BUNCH of new designs coming down the pipe in the next couple of months: special new single patterns, designs for Sweet Georgia Yarns, other more secret items, and my spring lace collection Handmade in the UK. So much knitting, so little time! As a Scot from close to Edinburgh living in Canada,Saskatoon I can appreciate both sides of this. Aaaaah, I was going to suggest K1 Yarns to you the other day but I thought I was too late — I thought you might already be gone from Edinburgh. It’s one of my favorite stores, which is kinda sad since it’s a 9 hour plane flight away. Sad indeed is the 9-hour transit time between Alexa and I!